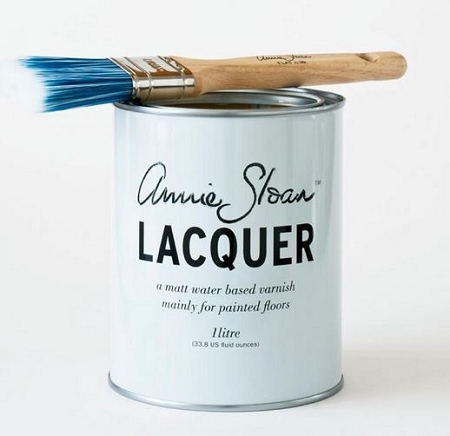 Annie Sloan Lacquer is a clear matte water based varnish for painted floors or heavily used furniture items, particularly for those painted with Chalk Paint® decorative paint by Annie Sloan. I do not typically use Annie's Lacquer on cabinets. I would typically use Annie's Clear Wax or the Artisan Enhancements Clear Finish. Lacquer is NOT like paint. Make sure to read our instructions so you use it correctly the FIRST time and do not waste your product, time or money, OK?! 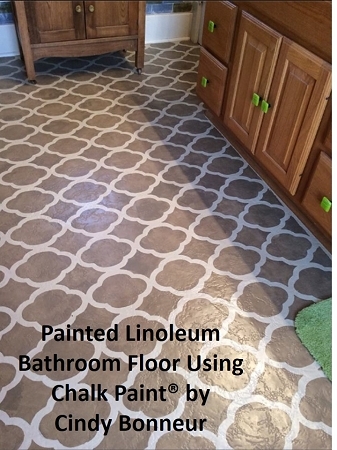 It is a strong penetrating Lacquer meant to be used over wood or concrete floors painted with Chalk Paint® that are interior floors only. This Lacquer is NOT intended to be used outside. Again, this is for INSIDE use only. Note- this is not recommended for outdoor use. Since this is a "penetrating" sealer- it could have the ability to pull up tannin or stain from the substrate thru your paint. So, if using a "white"- you may want to consider making the investment in extra- and apply a coat of Lacquer BEFORE painting. We would call this a "Sealer Sandwich." This will seal the floor (the substrate) - so nothing can get pulled up. 1 liter for every 100 sq. ft. That is for two coats. Personally- I water the first coat down with about 10% water, but never thin the second coat!. ALWAYS and roll on in super thin coats and watch your lap lines. Whether the paint is applied as a wash or applied solidly with a foam roller, this robust Lacquer will seal it perfectly. Lacquer can be used over stained or raw wood. If the floor has stain on it, - since Lacquer is water based- I recommend that you test what is on the floor to determine if it is oil-based or water-based. Just rub a small area with a rag and a bit of mineral spirits. If the finish softens and a bit of color comes off, it's oil-based." If it is oil based- Lacquer should NOT be used. It is critical that before and DURING use of Lacquer, you mix it using a stir stick and REALLY scrape the bottom. There are flattening agents in the Laquer and they like to settle at the bottom of the container, .......so this is critical! You need to stir it every few minutes to keep the flattening agent evenly distributed OR you will have areas on the floor once dried that have uneven shine and cloudiness. You cannot just stir it once and then use it for your whole floor. It dries quickly - but again, allow your floor or furniture piece to cure overnight. It will slightly darken the color beneath it with a matte finish that has a slight sheen to give it strength. Something to understand when using Lacquer is that it does not want to be back stroked. Confident strokes in one direction for an even sheen is extremely important because varnishes do not like to be back brushed. This can cause flashing...meaning an uneven finish. The Lacquer will slightly darken the paint beneath it. Something to keep in mind...is that Graphite (and dark Chalk Paint® colors) are notorious tattle talers! Meaning if the Lacquer is too thick- it will appear to be streaky or cloudy. The flattening agents in the Lacquer that give it its matte sheen create a cloudy or milky effect when the Lacquer is applied too thickly and this is more noticeable over darker colors. I hate to write this- but often repainting and then thinner layers of Lacquer applied with a sponge roller or brush is the correction. So, since you are reading this- I would hope that you would not apply it too thick! Some people will sometimes take a wide sponge brush or bristle brush to even out the rolled out Lacquer immediately after rolling it - as so to make sure it is thinned enough. Keep in mind the comment above about stroking it too much! Also- it is important - to make sure that the Lacquer was incorporated well before using it. Again- this is done either by stirring- or- tipping it upside down and rolling the container in your hands. The varnish is quick drying, non-toxic, low odor, and non-yellowing. The Lacquer will give you a very durable scuff resistant finish. Note though, it is not recommended in areas where there will be a lot of water. Annie's Lacquer is ring resistant- meaning it can tolerate hot cups. It is also resistant to alcohol spills, which if using wax as a top coat- is not. Annie Sloan Lacquer dries to a matte sheen with just a hint of shine for durability ... it is not glossy. NOTE however- the sheen can vary slightly from quart to quart- so always batch your Lacquer when purchasing multiple quarts and mix well- so the sheen will be uniformed throughout your entire project. Annie Sloan Lacquer can also be sprayed, but most apply with a sponge roller or a "bouncy" bristle brush. Again, with most spray systems it will most likely need to be diluted with some water. My experience with working with the Lacquer has shown that the sheen level diminishes a bit with the addition of water ... the more water added the more matte it becomes. With either product, try not to exceed adding more than 20% water. If you brush it on - have confident strokes- since Lacquer does not like being over played with. The darker the color of the paint- the more following these directions is important because they reveal or show imperfections more. The liter will cover approximately 107 square feet (depending on how porous the surface and how thickly the Lacquer is applied.) Two coats are recommended for areas of high traffic (never substitute one thick coat if in a hurry- it will not dry uniformly and you will just have issues- this rule applies to paint and for that matter - ANY product on the market!) I applied it on the top of a heavily used dresser and it was dry to the touch within minutes! Before use, turn the container upside down for about 1 to 2 hours since all the "good materials" that may have sunk to the bottom get well incorporated again to the top and is well dispersed. An average coating needs to dry 1- 2 hours before another coat can be applied. BUT if you live where it has been rainy or damp- this will effect dry time!!!! Leave it overnight to "cure" before walking on it. And initially- only walk on it in socks- NOT stilettos or hard soled shoes. Give a couple of days before the kids ride the big wheel across it to and DO NOT DRAG furniture. Carry and place it in position!!!!! CLEAN UP OF BRUSHES: Wash brushes/sponge rollers thoroughly in water. Note that Annie Lacquer is NEVER applied over waxes! However, you can apply Annie Sloan's soft waxes over the Lacquer. IF YOU have a LARGE SURFACE- and need to use more than one quart of Lacquer- ALWAYS BATCH multiple quarts and mix well to ensure the sheen will be the same- since Lacquer can vary slightly from quart to quart!!!! We recommend a product called Fabuloso. You mix it water and you do not let it pool on the Lacquer. WalMart and other "fine" stores retail this cleaning product. It is also great to pour down a drain or even in your toilet bowl- and leave it for an hour. It will make your room smell like you cleaned it for hours. Photos, displays and work designed and created by Annie Sloan. We are sorry – there are NO RETURNs when it comes to paint/ paint products/ top coats/ waxes. You will find this for every stockist. Think about it- would you ever want a quart of paint sent to you - that was shipped to someone else prior? We eliminate any potential issues with this policy.